My professor Bryan Cheyette aside from being a literary scholar is a Dylanologist. In a personal sense, Dylan is a connection–when I first began to think about doing my doctorate, I spent several amazing times talking through ideas with Christopher Ricks, Dr. Cheyette names “Dylanologist-in-Chief.” After the topics that Dr. Ricks and I were discussing didn’t lead to an obvious PhD topic, I went home and came up with my current work, and now have the honour of working with the “Anglo-Jewish Literologist-in-Chief.” Read Dr. Cheyette’s essay on Dylan and his connection to Jewishness at the University of Reading, English at Reading blog. 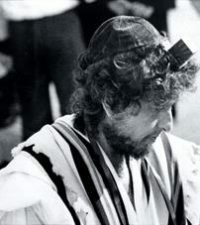 This entry was posted in Academic, Anglo-Jewish Lit and tagged Bob Dylan, Bryan Cheyette, University of Reading. Bookmark the permalink.